Engineer an Unmanned Aerial Vehicle. Students apply traditional engineering design processes to create unmanned aerial vehicles (UAVs), more commonly known as drones. Once applied mainly to military operations that were too dull or too dangerous for humans, the application of drones is rapidly expanding in many areas, from recreation to use in the commercial and agricultural sectors. Students learn to think like today’s engineers by engaging in a design process to get from problem A to solution B. Using creativity and basic building materials, students will brainstorm, model, test, and improve their drone design. Quantitative measurements will be taken during the design and testing phases, including testing propellers for direction and force. This kit includes one drone and activities to engage eight students. 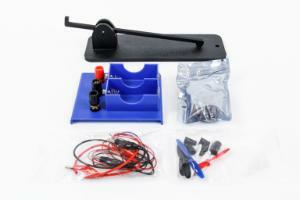 Ordering information: Kit includes three types of propellers, simple motors, circuitry, battery case and teacher’s guide.